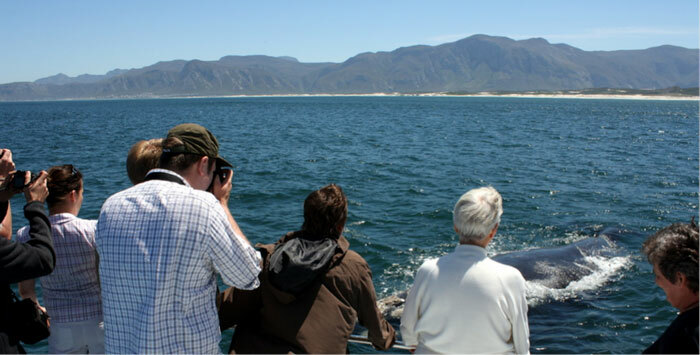 Two Africa Geographic team members drove out to Gansbaai in September to join Ivanhoe Sea Safaris for a whale watching experience. When we arrived at Gansbaai Harbour we were warmly greeted by Elizna and taken to Ivanhoe – our catamaran. After a short briefing on safety, lifejacket use in an emergency and general boat rules we headed off in search of the underwater beauties. The trip took us far out over choppy waters, during which we discussed the protocol of approaching the whales.By law the catamaran has to stop a specific distance from the whales, however if the whales then willingly approach the boat it is acceptable. We were also advised that we would spend around 15 minutes with each encounter as not to disturb them in their natural environment. Then there we were, our first stop, the boat perfectly positioned in the water so that all guests could safely move to the bow for a better view, our first whale snaking along the top of the water breaking the surface with its glossy back. Our guide told us that it was a Bryde’s whale – a very rare sighting, which was extremely exciting to say the least! On the search for something new we left our lucky find behind and came across a mating group of five southern right whales – one female chased closely by four persistent and noisy males, which sparked the question as to the mating process of these giant creatures. It was said that the “strongest” (most fertile) adult male would ultimately father this female’s calf and that if there were infants within the group they would simply be using this time as a practice run until they reach maturity. We stayed with this group for a while as we perched on the bow, cameras waving about as we snapped shots of these majestic creatures. 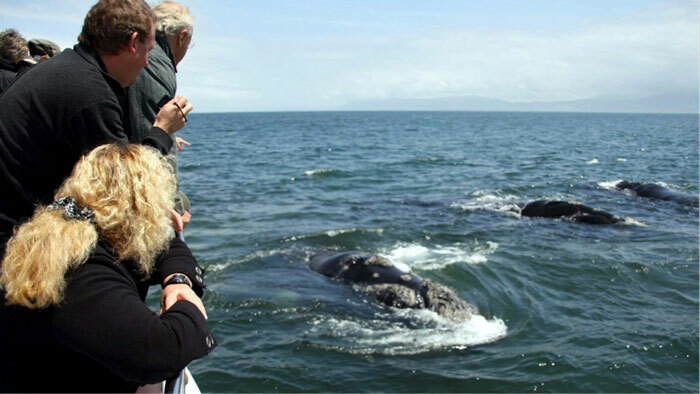 The whales then shifted gear slightly and all attention was drawn to the opposite side of the boat where an odd mottled grey whale (a brindled whale) had popped up for a perfectly timed visit. Research shows that in South Africa 3.5% of whale calves are in fact born white (they are not classed as albinos) with a black collar and black spots on their back. 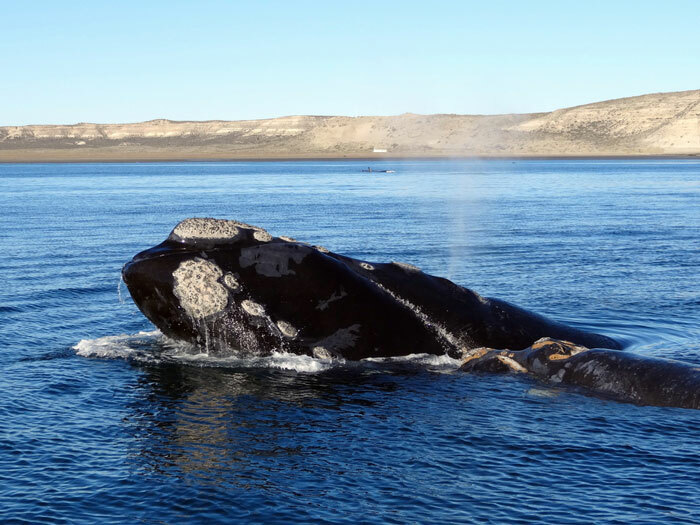 The white colour gradually changes into grey as the whale ages – with the black collar and spots still remaining – giving them the brindled effect. We then approached a pair of southern right whales swimming side by side – young ones who under slightly better weather conditions have been known to approach the boat and get rather playful alongside the guests, popping their heads out to see what’s happening or playing gently beneath the boat. Unfortunately we weren’t able to get this close on our visit, but it does make a future trip very appealing – especially during the whale festival/the warmer part of the whale season! This is where our trip came to a close – snapping up our last shots of these young whales as they slinked underwater, only to rise again from a dark shadow and flash their barnacled backs, wave their “flippers” and farewell it was. With a refreshment in hand we headed back to the dock.